Can Randy Gregory be a defensive force for Dallas in 2018? 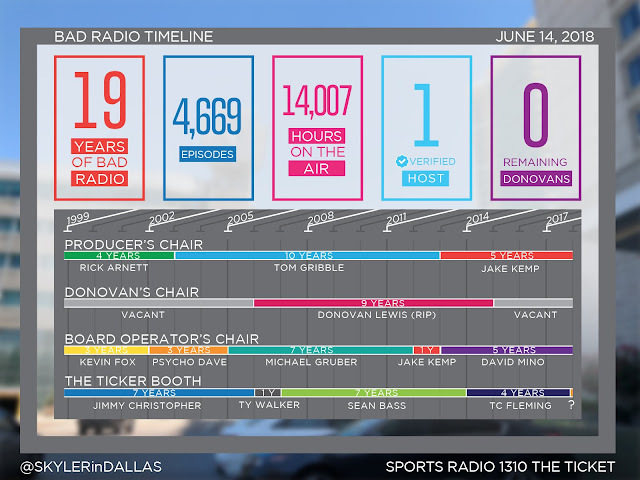 BaD Radio Turns 19 Today! Thanks to our friends @SkylerInDallas for this infographic! Will Dalton Schultz be the tight end the Cowboys need? Is Ezekiel Elliott’s workload a reason to worry about his future? -- The Cowboys were 9-0 when they held opponents under 21 points. -- Therefore, they were 0-7 when the opponent scored 21 or more points. -- They were eighth in the NFL in fewest yards allowed. In a league where games saw the average team gain 334 yards per game, the Cowboys allowed 318. -- Dallas was eighth against the run (per game), 11th against the pass (per game) and 10th in yards allowed per play. Flirting with top-10 status in all of these departments is pretty solid. -- The Cowboys also were second in negative plays! That is a huge development that we will explore a bit later. Sixth in conceding explosive plays, second in opposing field position (not really a defensive stat, but it does really matter), and second in the entire league at winning on first downs. -- They were 13th in the NFL in points allowed. League average was 21.7 allowed per game, and the Cowboys conceded 20.8. Right about at the average. They also finished with 21 takeaways, which was slightly off the league average of 22. -- Dallas was average in sacks per pass attempt (16th) and first downs allowed (16th). Rushing yards per play, it ranked 18th. -- Finally, the Cowboys were at the bottom of the league in interception rate (27th); third-down defense (29th); successful plays allowed (30th); against third and short (32nd); and second-down rushes (32nd). That all adds up to about what you would expect. Decent defense. Promising developments at some spots. Still lacking a few premium playmakers, but there are some pieces in place that suggest there is some good stuff happening below the waterline. 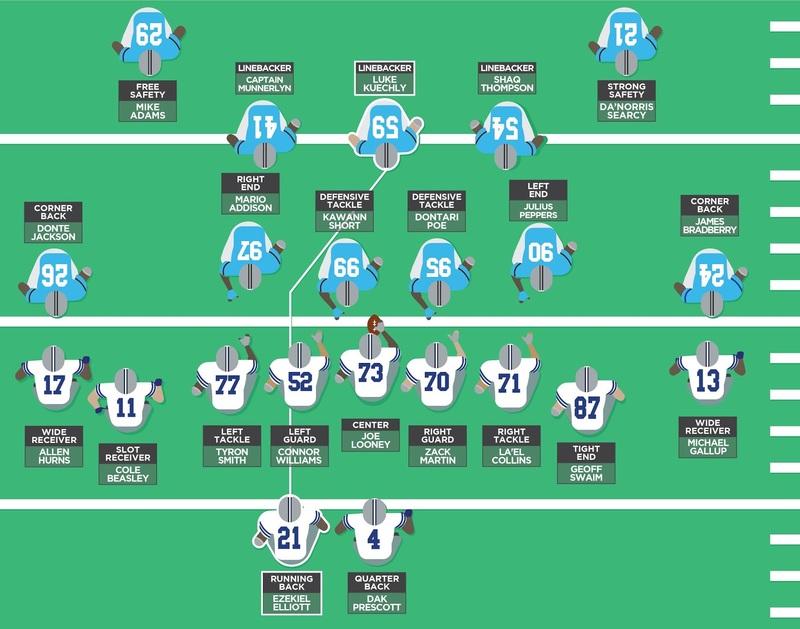 The Cowboys missed starts of significance because of the following: David Irving missed eight games (four to suspension/four to injury), Orlando Scandrick missed five, Sean Lee missed five, Anthony Hitchens missed four and Chidobe Awuzie missed about 10 (if we consider him a starter, which I think we should). Add in one absence for Jeff Heath, and this cumulative total of 33 missed starts (out of a possible 176 for defensive starters) may not sound like anything extraordinary, but in a hard-capped league where depth is rare, 81 percent attendance is not considered excellent. For instance, the Minnesota Vikings have the best defense in the industry -- but also the healthiest. They had 98 percent attendance from their 11 starters this season, which certainly demonstrates some luck that their offense did not receive. But for the Cowboys, it seems rather clear. When you don't have blue-chippers all over your defense, you need those you do have to stay on the field. A dependence on Lee was likely the difference between making and missing the playoffs this year, from a defensive standpoint. And, without question, losing a destroyer like Irving for all of September and all of December pretty much sunk their ship. I really don't want to spend too much time on the defensive play from Sunday. The Eagles had no quarterback play at all and did not seem too concerned about anything other than getting the game over with. The Cowboys certainly padded their stats for the year and left feeling great with a shutout. They ended the year with seven different performances in which the opposition did not even pierce the 300-yard mark, which is some very impressive work, to be fair. Again, this shows you how no linebacker finished in the top seven in snaps. That is a real issue because the defensive line is not trying to get high snaps, but rather a deep rotation. We are used to defensive backs dominating snap counts, but not this much. And Irving played significantly fewer snaps than Taco Charlton and Benson Mayowa. Just when you thought the Cowboys hardly blitzed, they took it down even further and further this season -- 17 percent is a new low, even for a team that already never blitzed. In a league where the average sits at about 30 percent, blitzing is just not something Rod Marinelli is interested in doing. 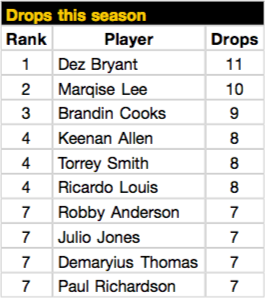 Not sure we have ever seen this, but the drop from DeMarcus Lawrence to the rest of the team was absurd in 2017. It didn't help that the next two players -- Irving and Lee -- each missed significant time. 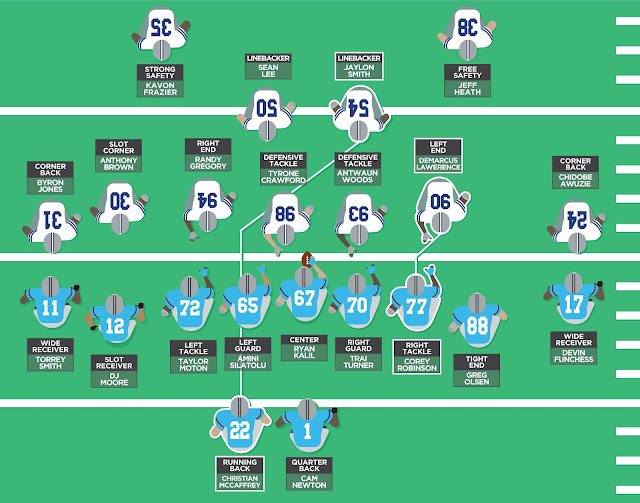 It also may demonstrate that the Cowboys have a lot of players on defense, but not a lot of playmakers. So when you are missing your two difference-makers, the defense becomes ordinary very, very quickly. The story of the 2017 Cowboys defense is this: It had three playmakers and two missed significant time. Therefore, you need to find more playmakers for this defense to have a chance to improve. By the way, your only consistent playmaker who had consistent attendance in 2017 is now out of contract. 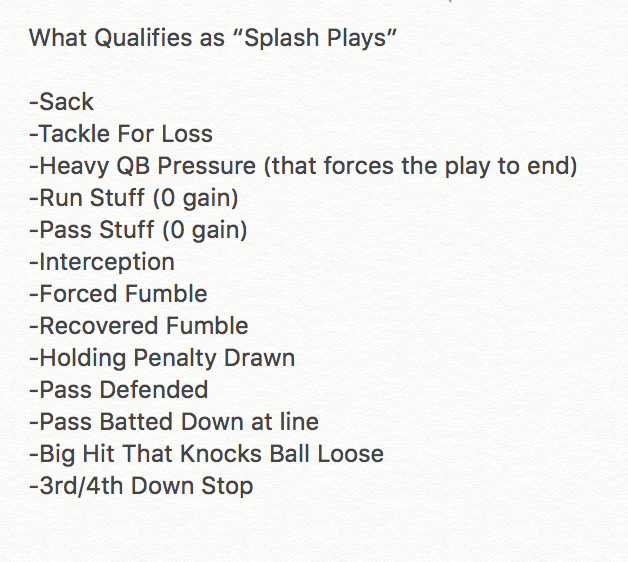 We have known this for weeks, but here are your annual splash play champions since 2011, when I started tracking this number. We wondered if we would see our first 40-splash season, but Lawrence fell just short, tying DeMarcus Ware's 2011 season. But, look, he did it in 209 fewer snaps! That is clearly our tiebreaker, so, in the history of the splash play index, we have a new top season ever. I don't believe there is any chance Lawrence goes anywhere this offseason. He will either get a long extension or get franchised. We should not rule out either because the Cowboys certainly could talk themselves into a short-term solution, but I would just get that four-year, $60 million offer out there and get it over with. Lawrence is very good and Irving is right there with him. 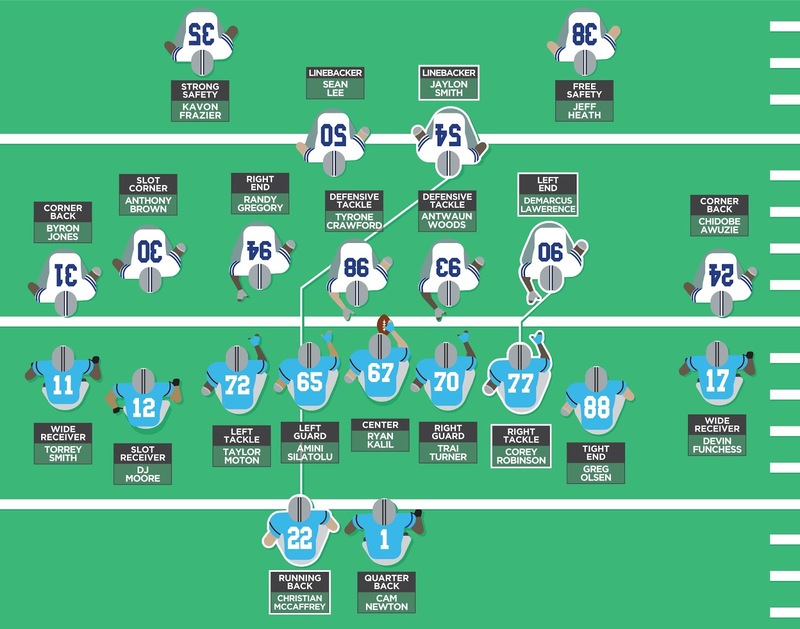 It is up to them to put their suspensions behind them and give this team a full 16 games next year and beyond, because those two, along with some nice pieces -- Charlton for one -- should have the defensive line in a spot where it just needs a run-stopper in the middle to bring it all together. The D-line was one of the league leaders in negative plays. Lots of sacks and tackles for loss all season long. Really great stuff up front, but it was surrounded by too many situations when the opponent was able to recover and move the chains by kicking the Cowboys' rear on third downs. The wild card remains Randy Gregory, but I will not discuss that at this time because there is so much unknown. At linebacker, you have Hitchens without a deal and Lee in a familiar spot for him: one of the best in the sport for 10 games a year. It is a weird proposition and his is an odd career to evaluate. But, wow, does he make a difference when he is on the field. And then you have the wild card of the linebacking corps, Jaylon Smith. He improved as the season went on and played a lot of snaps. It is reasonable to think his 2018 will be that much better, but if ever there was a wild projection, it would be that. Then, in the defensive backfield, you have optimism stirred by Awuzie's final month and Jourdan Lewis' season. I have always rated Awuzie higher, but both are quite capable. Byron Jones is still a piece, albeit with a lower ceiling than we hoped for, it appears. Scandrick's future is in question, as his body has been through plenty and he is getting up there in age. They can still use a playmaker back there if the draft smiles down on them. Perhaps getting an "ace" back there (your own Earl Thomas-type) could make the whole rotation make sense. You have pieces on defense. You need more. It is a league of extraordinary talent beating ordinary talent every week. 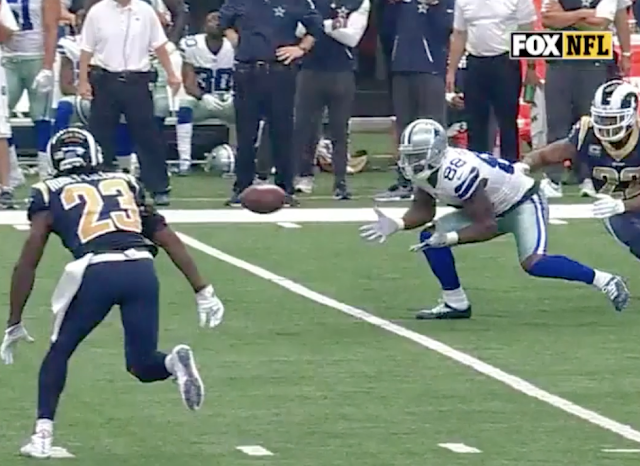 The Cowboys simply need a little more extraordinary to bring this side of the ball together. The 2017 Dallas Cowboys season ended in more disappointment. Sure, the record books will reflect it ended with a shutout win over a divisional rival that had a wonderful year, but let's not kid ourselves. That 6-0 win over the Eagles will serve to push the Cowboys down the draft order and do little else to soothe the wounds of a season that will be remembered as a massive underachievement. As we look back to how the season will be remembered, I find it rather safe to point to the week of Nov. 5 as a good dividing point. And since symmetry makes things a bit more digestible, it should be noted that this halfway point in the season means eight games fall on each side of the dividing line. On Nov. 5, the Cowboys smoked the Kansas City Chiefs (then 6-2) at home in a game that was thoroughly impressive. Everything they did that day seemed to work, and after dismantling one of the league's early-season contenders, Dallas looked more than poised to continue to challenge for a fine playoff spot and, perhaps, a run to Minneapolis. 1.) Ezekiel Elliott's last motion for an injunction in his legal battle with the NFL was denied, and his six-game suspension was immediately reinstated that Thursday. He would miss the next six games in full and end up playing in just 125 (24 percent) of the possible offensive snaps the rest of the season. 2.) Tyron Smith aggravated his groin against Kansas City and missed five games either in full or in part through the remainder of the year. Sometimes it was the groin, others it was the back, and then the knee was listed on the injury report, but after playing in 529 snaps in the first half of the season, he would drop to 229 in the second and be replaced by some very poor performances from reserves. Now, one could engage in some spirited debates over which one you would rather have, which one you are better equipped to replace and which one is an overall rare talent in today's NFL. But, know this, in any ranking of Cowboys assets, you would definitely place Smith and Elliott in the top five and, perhaps, as the top two. They are both in the top handful of players at their position and are both among the league's best players. One plays a glamorous position and does so with no fear of a camera, while the other seems to be far more anonymous in fan circles -- but make no mistake: they both are rare gems, and to lose them both will certainly be felt. Above you see the realities of the two halves of the Cowboys season. Sure, they were only 5-3 through the first eight weeks and 4-4 in the second half, so books will not be written about the two halves being strikingly different. But if you watched the season -- as you no doubt did if you are reading this -- then you know they always appeared to be in the mix during the first half of 2017 and never seemed close once the Atlanta game kicked off, signaling the second half was beginning. They easily were a top-10 offense and most of their offensive statistics in the first half of 2017 matched those in 2016. But then they lost Smith and Elliott. Instead of playing a total of 993 snaps in eight games, the two talents combined for just 354 snaps in the next eight games. If you want to quantify the difference, it is all in that graphic. They went from 28.3 points per game to 16. They went from being the eighth-most productive offense to 26th. They went from the second-best pass protection team to 25th. They turned the ball over, guys couldn't get open and drives were no longer sustainable. Yes, the NFL is a quarterback-driven league and Dak Prescott went from a reasonably able quarterback to a guy who didn't have a clue. He went from being a guy who had all the confidence a young quarterback could have to one whose fan base no longer believed he was glittering gold. He had a 24-game track record of competence and then instantly lost all ability to play quarterback at this level? And you are telling me that quarterback can't play at precisely the same moment his two most valuable pieces vanished from his offense? Is it possible the attendance record of his two most important offensive talents might have something to do with this? Can we explain much of the 2017 decline by the quarterback with the fact that, instead of getting sacked 10 times in eight games, he was sacked 22 times in eight games? Or that teams did not treat the understudies of Smith and Elliott the same way they would those two? Smith missed two games against the Falcons and Eagles in which Prescott was sacked (often hard) 12 times in eight days. Is it possible that this affected him greatly -- his poise, composure, pocket presence and overall ability to orchestrate an NFL offense? Look, I am not trying to tell you that Prescott is not a concern. I am not trying to tell you this offense is still one of the best in the sport. There are issues, and some of them are getting worse. But you are telling me that I have 32 games of evidence with which to evaluate this offense. We have two groups: In Group 1, I have 24 games of evidence where almost everything looked really impressive and the offensive pieces fit together in a way that made us discuss their resemblance to the Cowboys' old dynasty (and they went 18-6) ... and in Group 2, I have eight games of evidence where the All-Pro left tackle and All-Pro running back were gone for almost all of it and the offense looked lost without a compass. Now, which should I weigh more heavily in my evaluation? Before we decide to clean house and replace everyone as soon as possible, should we take a few breaths and consider things carefully? I think there are some real issues. This team has been horrendous at generating big plays through the air and yards after catch over the past two seasons. That must improve. And for that reason, I think the coordination of the offense -- scheme and personnel -- should be looked at closely. That is an evaluation of 32-48 games that goes all the way back to the "Dez Catch," to be honest. But to conclude that the "214" era of the Cowboys cannot work moving forward seems to miss the fact that when it is assembled, it has worked very well. Smith and Elliott are wonderful talents. Losing one of them could wreck your offense's ability. Lose them both simultaneously, and perhaps you should expect everything to crumble. I don't think we should spend too much time on Sunday's game, unless you wish to depress yourself further with the truth that as bad as the offense was -- and make no mistake, it looked absolutely atrocious -- it generated the third-best yardage production of the season's second half. Let that soak in for a moment -- 301 yards of offense in that ridiculous game in Philadelphia was better than the offensive production against the Falcons, Eagles, Chargers, Redskins and Seahawks. Everything seems broken right now. The offense had a really tough year and slid back in many statistics. It has a rather stale scheme in terms of creativity and inserting new components/personnel, but as we stated above, stale is when you are losing. When you are dominating, we describe it as "sustainable and repeatable" and a battering ram that shows no mercy to opponents. I don't think I can explain why Rico Gathers and even Ryan Switzer were not considered for much use. Hopefully we will soon be told the truth behind the Gathers situation. Was he concussed so badly that he disappeared completely, or are the Cowboys just reluctant to put him out there because they don't think he is that good? Switzer, even in the meaningless game against Philadelphia, showed he had an awful lot of elusiveness that should be used as a weapon moving forward. Basically, it looks like the offense lacks athleticism, but those two players are already in the building and seem to have athleticism for days. I would strongly consider examining the play-calling and modifying route combinations to attack more horizontally and vertically. Everyone wants vertical, but horizontal attacks are needed just as much. Each play seems to result in hooks and comebacks, and those do not lend themselves to many yards after catch. I also need better teaching for my quarterback. If that means veteran backups or a different quarterbacks coach, or just more deliberate methods that might include asking him to do less orchestration of the offense himself, then it is OK to slow down the desire to give him the keys to the Tony Romo offense. Let Prescott climb the ladder because in 12 months time, you must know if he is your quarterback or not for 2019-25, as he will get much more expensive then. You don't want to sign a regrettable $100 million deal with a guy you aren't sure about. The next 12 months need to make you sure. You also need better depth on the offensive line and prepare for the possibility that Smith's most durable years are behind him. You can hope you are wrong, but you had better prepare to be right. There is plenty of work to be done. But I would not reach for the dynamite.